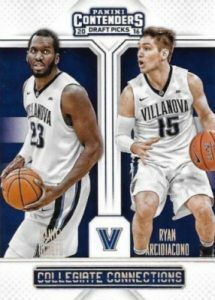 Taking another go at the NCAA hardcourt, 2016-17 Panini Contenders Draft Picks Basketball gives seasoned NBA stars and the new crop of rookies a collegiate makeover. Collectors can find five autographs in every hobby box. 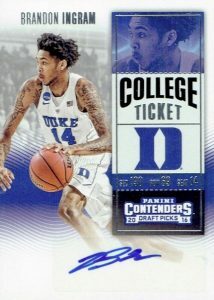 Centered around the familiar Season Ticket base set that features NBA players during their college days, the main appeal for 2016-17 Panini Contenders Draft Picks Basketball stems from the many College Ticket Autographs. 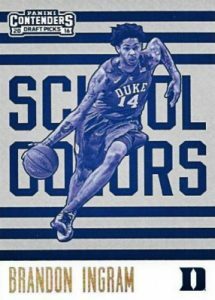 Totaling 87 cards, the biggest names of the 2016 NBA Draft are showcased here with multiple hobby-exclusive parallels. Numbered college parallels include Draft Ticket (#/99), Playoff Ticket (#/25), Cracked Ice Ticket (#/23), Championship Ticket (1/1), and Ticket Printing Plates (1/1). Featuring notable foreign-born players, International Ticket Autographs are also in play. 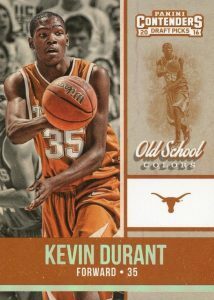 Other signed options in 2016-17 Panini Contenders Draft Picks Basketball include the superstar-based Alumni Ink while Collegiate Connections Signatures looks to the current rookie class for teammate autograph pairings. School Colors Signatures also documents the 2016 rookies. Going further back, Old School Colors Signatures offers more established NBA names. 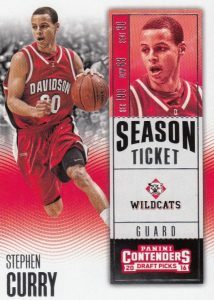 Each averaging one per pack, inserts are very common in 2016-17 Panini Contenders Draft Picks Basketball. 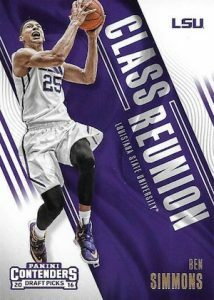 This includes Class Reunion, College Connections, Game Day Tickets, Old School Colors and School Colors. PARALLEL CARDS: Draft Ticket #/99, Cracked Ice Ticket #/23, Championship Ticket 1/1, Printing Plates 1/1. 74 cards. *Cards found only in parallels noted below. PARALLEL CARDS: Draft Ticket Blue Foil, Draft Ticket Red Foil, Draft Ticket #/99, Cracked Ice Ticket #/23, Playoff Ticket #/15, Championship Ticket 1/1, Printing Plates 1/1. PARALLEL CARDS: Draft Blue Foil, Draft Red Foil, Draft #/99, Cracked Ice Ticket #/23, Playoff Ticket #/15, Championship Ticket 1/1, Printing Plates 1/1. PARALLEL CARDS: Draft Tickets Blue Foil, Draft Tickets Red Foil, Draft Tickets #/99, Cracked Ice Tickets #/23, Playoff Tickets #/15, Championship Tickets 1/1, Printing Plates 1/1. Buyers remorse hit me immediately, horrible hits, uninspiring cards. Regret buying the box. Picked up a lucky 7 packs at the LCS today after work. Pulled 4 autos…so yeah I’m happy and gave it 4 stars. 2 1st rounders – LeVert and Luwawu, 1 2nd rounder Hammons, and free agent RC Wayne Selden Jr from Kansas. A good mix of players. Only thing that would’ve been better is if one of them would’ve been numbered. Oh well, can’t complain too much though for only getting 7 packs. anyone figure out the difference between regular and variation yet? Bought six packs … yes, six packs, and pulled a 1/1 Ben Bentil Championship ticket, an International auto cracked ice of Dragan Bender and two other autos, including Tyler Ulis of Kentucky. I would say I did well. Do not like the cards. Purchased six packs at my LCS no Autos, no hits, no luck! 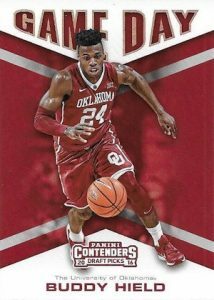 2016-17 Panini Contenders Draft Picks Basketball Hobby Box FREE SH! NEW!